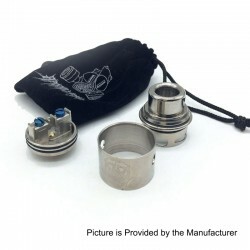 Today we recommend you the Apocalypse GEN 2 Style RDA Rebuildable Dripping Atomizer with BF Pin. Maybe your guys start wondering,with all these similar thread posted before,why we intend to introduce you with another copy of the Apocalypse GEN 2 Style RDA.Apart from these former RDA we recommended you,this one is made from titanium. The Apocalypse Gen 2 RDA Clone is with clamp design and has a massive 13mm space in each clamp which provides space for mounting the most complex and insane coil builds. Coupled with the 4mm deep juice well, 21mm build deck, durable post clamps and extended post screws, the Apocalypse Gen 2 is a builder's dream.